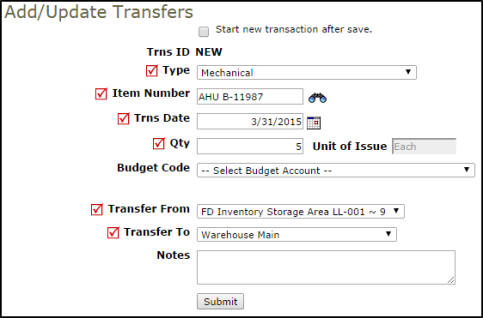 Transfer transactions are used when you need to move inventory items from one pool to another. Transfers do not change the on-hand quantity amount or the total cost of the inventory, they only change the quantities in the individual pools. Required fields are indicated by a red check box . Click on the Transfers link in the Transactions section of the home page. From the My Transfers list, click on the + Add New Transfer link on the right side of the list. From the My Transfers list, click on the New Transfer (Clerk Form) link in the Shortcuts section at the top of the page.